Video shows a man who's been deprived of some body parts but made use of what he got. 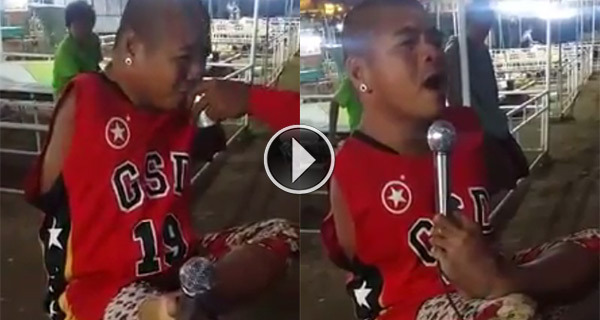 Watch this armless man sing "Dance With My Father." The uploader, Evie Malabanan-Mendoza, said she took the footage at her videoke place and posted it on Facebook with hope that actor-comedian and television host Vice Ganda will be able to see it and feature the man on his show, "Gandang Gabi Vice." It already garnered nearly 3 million views after being uploaded a little over a year ago. The video got social media attention again this year as netizens found it very inspiring. Many said the armless man with the golden voice serves as a role model for Filipinos who proudly showcase their God-given talents despite their physical disabilities. The singer, who uses his feet to hold things (in this video the microphone), may be struggling to do a few routinary task in a day but, as soon as he opens his mouth and start singing, he's going to put normal, judgmental people to shame.